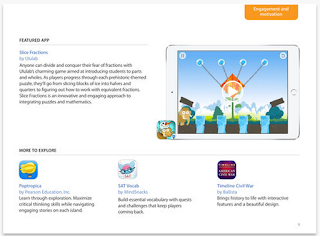 Evaluating Apps for the Classroom is an excellent free short interactive eBook (15 pages) created by Apple Education to be read on iBooks. As its title indicate, this guide is meant to help teachers make informed decisions about educational apps to integrate in their classroom instruction. Sifting through tons of educational apps in the App Store can be a daunting task especially for teachers whose schedules are already full enough to allow for such an endeavour. This is where the utility of such a guide comes in handy. It provides you with a set of tips and ideas to help you better evaluate educational apps and tap into the learning potential of iPad. Evaluating Apps for the Classroom provides an evaluative framework comprised of five main criteria for how to evaluate educational apps. These criteria include: developmental appropriateness, instructional design, engagement and motivation, balance of interactive features, and accessibility. Each of these five criteria is further explained with a set of guiding factors and illustrated with few examples of apps that best demonstrate it. Planning to integrate iPad in your instruction, Evaluating Apps for the Classroom is definitely a must have guide.